Update No 21 included a photograph (C 1908) of the the Snells Park home of Samuel(2) and his family. There was reference to the maid employed by them. The photograph (right) was taken earlier the same year and depicts Hilda and Gladys with Gertie". 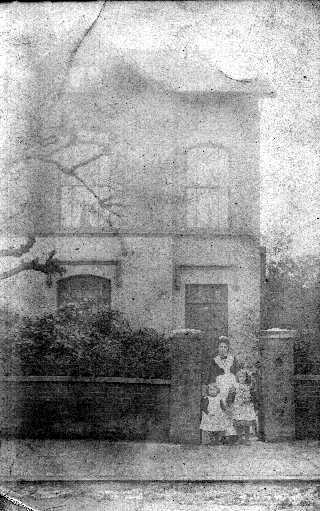 Hilda has recorded "..... photo taken at the gate with my sister and Gertie the maid". Gladys recalls "...........a photo of me standing with Winnie at the gate, another maid was called Gertie. It must have been Winnie who married "Brownie" who was employed by the South firm and who used to bring our milk. The milk must have come from my father's cows kept in fields around Devonshire Hill Lane". The description on the reverse of the card reads "Gertie, Hilda & Gladys, 39, Snells Park, Edmonton"
Shortly before potmaking ceased at Samuel South & Sons in October 1960, Peter South climbed the access scaffolding onto the roof of the three storey warehouse office under construction on the neighbouring site of the E G Cole pottery that had been sold some three years earlier for development. 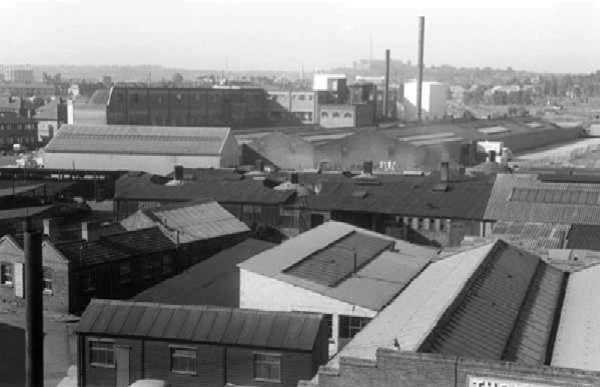 Peter photographed the Potteries from this unique "birds-eye" vantage point. Two of the photographs are reproduced below and further selections will appear in future editions of the Update. Looking west towards Wood green: White Hart Lane to left. 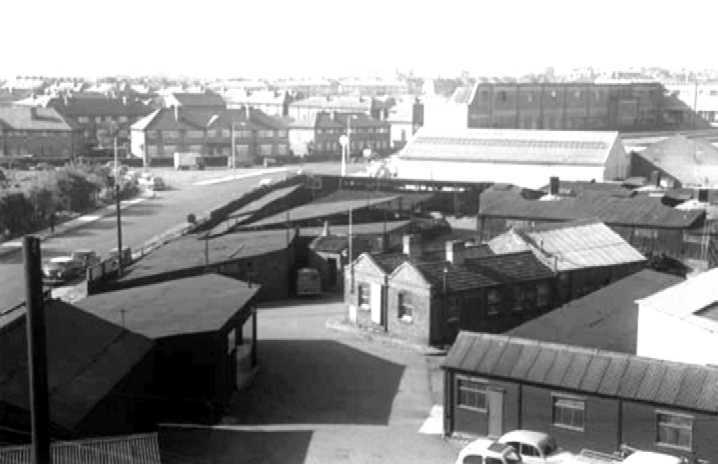 Pottery entrance yard; office building with double pitched roof and canteen behind. There has been the opportunity to carry out an initial study of the Bank passbook of Samuel(1) mentioned in Update No 10. The account was held with the London & Provincial Bank Ltd, later absorbed by Barclays, and the passbook, similar to a bank statement, records each deposit made (amount only) and each cheque drawn (amount and payee) for the period June 1886 - Sept 1892. All but 9 of the 360 deposit entries are for cash receipts thus demonstrating the need for the protection employed by Samuel(2) when collecting monies due from customers and described in Update No 13.
the account is used for business transactions, for example, payments to Rickett (Coal Merchant), Boulton (Engineers), Bounds Green Pottery etc. the volume and value of the receipts and payments are far in excess of those anticipated for the Dysons Road pottery that in 1881 employed "two men and three boys". the passbook opens with a cash deposit of £98 in June 1886 and not the transfer of an existing balance indicating that it was a new account, perhaps, opened because of the new venture. the first three payments, totalling £55, were made to Sankey, the previous occupier of the site, and it can be speculated that such payments were for equipment etc. The results are even more impressive when considering that Sankey withdrew because he was unable to make the Pottery a paying proposition. The income was likely to have been more than recorded because cash received could be used to pay bills without passing through the account. The investment of £22-5s-0d (1998-£930) by Samuel(1) when he bought the Dysons Road pottery from his father, Joseph(1), in 1874 was proving a success.